Blue diamonds, like all colored diamonds, derive their color from chemical impurities or defects in the crystal lattice structure. A chemically perfect diamond would be totally without color, but this is rarely seen. The most common impurity is nitrogen, which replaces some of the carbon atoms in the otherwise pure carbon crystal. This imparts a yellow or brownish tint. As can be seen on the color grading page of this site, small amounts of yellow tint detract from the value of a white diamond, but once the tint approaches a certain level of color saturation, the value increases. Diamonds with deeply saturated color are called "fancy" and are sold for premium prices. In nature, yellows, browns and champagnes occur most frequently, while blues, pinks and greens are more rare. Natural blue diamonds are so rare that most jewellers have never seen one. It is estimated that the earth produces 10,000 white diamonds for every one colored diamond, of any color. But in recent years, modern processes have been developed to simulate nature's own methods. Most of the beautiful blue diamonds that you see offered for sale today, are naturally yellow diamonds that have attained their striking blue color after being enhanced with man-made irradiation. Yellow and orange shades originate with nitrogen impurities. Blue diamonds gain their color from boron impurities. Violet hues come from hydrogen impurities. Red, pink, purple and cognac brown shades are the result of higher pressure during formation, which compresses the crystal structure of the diamond. Evidence of this can be seen under 10x magnification in many cognac and argyle pink diamonds. Green hues can result from natural radiation in the earth. At the top of this page your eyes were no doubt drawn to the photo of the exquisite Hope Diamond. 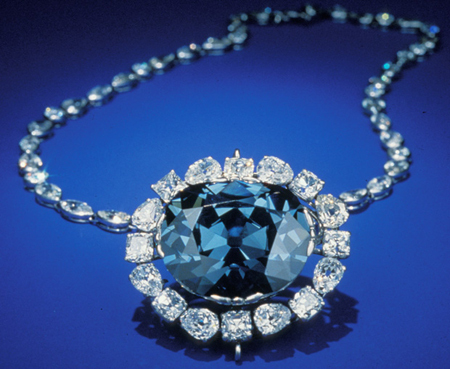 The Hope Diamond is the main attraction of the National Gem Collection at the National Museum of Natural History in Washington D.C. It exhibits a mysterious red phosphorescence, rarely seen in other blue diamonds, which persists for more than a minute after exposure to ultraviolet light. Almost all natural blue diamonds show phosphorescence, but usually the blue color dominates. The intensity of red and blue spectra, along with the speed at which it fades, can be measured as a kind of "fingerprint" for blue diamonds.